Include airlift tube and weight to help keep them submerged. To clean, just squeeze the dirt out and return to tank without interrupting biological activity. Suitable under normal biological loads in juvenile rearing tanks, ornamental ponds, and broodstock tanks. Manufactured and used by Florida Aqua Farms since 1985. Commercial sponges (SPF2 & SPF3) have been used in the tropical fish industry for years. SPF2 has 118 square inches surface area (5.0″ dia 5.0″ high), can be used in tanks up to 200 gallons. SPF3 has 290 sq. in. Can be used in tanks up to 400 gallons. SFF4 is a cylinder (12″ x 5″ dia., 235 sq. in. surface) which has solid PVC end support plates which suspends the entire filter off the bottom to maximize filtration and ease of cleaning. 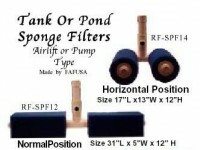 Both SPFf2 and SPF3 can be suspended above bottom with a string for ease of cleaning tank. All sponge filters regardless of the maker, should be presoaked and rinsed in freshwater for a week prior to use. We now offer two grades of sponge elements, our standard high density, small pore, moderate flow, element and a reticulated, large open pore, high flow, element. Efficiency of sponge filters are directly related to the surface area, flow rate, bacteria inoculation, biological load, and routine cleaning. Ideal for bare bottom culture tanks. Under normal use sponge lasts 2 years before replacement unless high concentrations of chlorine are used in cleaning the filter element.